The meaning of 'Ding' is the perfect concentration of thought into the one object of meditation. 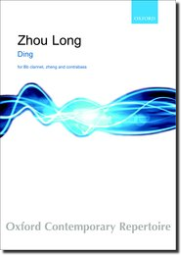 Zhou Long translates this Buddhist concept into concrete musical form by using an abstract-improvisational style and a slow tempo throughout. His thematic elements include a twelve-tone row and a tonal melody, which are treated with a variety of instrumental techniques, including blowing, striking, and bowing the instruments in their full range of pitches. The work combines elements of both Western and Eastern musical traditions.